Season the pork with salt and pepper. In a large skillet, heat the EVOO, two turns of the pan, over medium-high heat until smoking. Working in batches, add the pork and cook until browned on the bottom, 2 minutes. Flip the meat, season with paprika and cook for 2 minutes more. Transfer to a plate. Add the chorizo to the skillet and cook, stirring, for 2 minutes. Add the carrots, onion and garlic and cook, stirring frequently, until softened, 7 minutes. Stir in the wine and simmer for 2 minutes. Return the pork to the pan. Stir in the chicken broth and scatter the mussels around the skillet. Cover the pan and cook until the mussels open, 2-3 minutes. Remove the lid, sprinkle the cilantro on top and serve immediately with bread for mopping. In Recipes-list.com we have selected the most viewed recipes from category - uncategorized . Enjoy the best recipes specially selected for you! 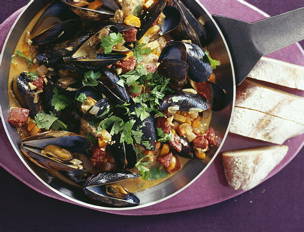 Alentejo Pork with Chorizo and Mussels is the right choice that will satisfy all your claims.